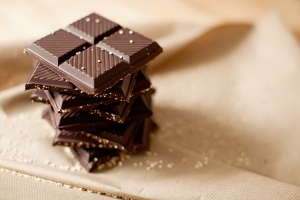 Rich dark chocolate with toasted quinoa makes a better crunchy candy bar. Lightly mist a skillet and when hot pour in the dry quinoa. Let it toast without burning for about 1-2 minutes. Over a double boiler, melt the dark chocolate pieces. Pour the chocolate in to candy bar molds, top with quinoa. Refrigerate until solid.